Children : 3 children, 2 sons and 1 daughter. A young singh from the village of Bhai Rupa which is near Bathinda, Bhai Gurneb Singh was amongst those Sikhs who listened to the speeches of Sant Jarnail Singh Ji Bhindranwale and with a positive attitude he walked the path of Sikhi. Bhai Sahib wanted to break the chains of slavery, for this reason he armed himself and fought the oppressing government of India and like a true Khalsa he gave shaheedi and wrote his name in the foundation of Khalistan. Bhai Sahib was alone and he realised that he had been surrounded by the police, so the only thing to do was to battle. Bhai Sahib fought for many hours and even when wounded Bhai Sahib did not stop battling till his ammunition ran out. Instead of coming into the hands of the enemy alive, Bhai Sahib swallowed a capsule of Sy-Nyde and attained shaheedi after his ammunition had run out. 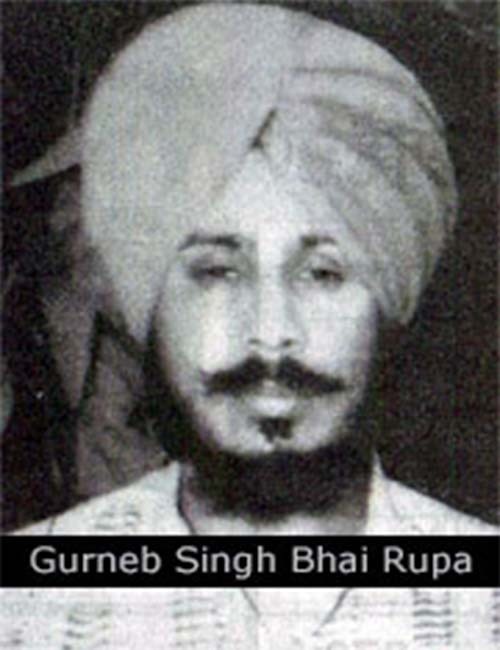 Bhai Gurneb Singh was born in the year of 1958, in the house of Sardar Bhag Singh and from the womb of Mata Nihal Kaur. Bhai Sahib studied up till 10th class at the local school of the village and after he opened a woodwork shop in a nearby village, Bhagta Bhai Ka. Bhai Sahib got married to Bibi Karamjit Kaur who was from the village of Valipur Kalan. Bhai Sahib and Bibi Karamjit Kaur had 3 children, 2 sons and 1 daughter. on 4th April 1983 Bhai Sahib and other Sikhs from the area blocked off GT Road Bhagta Bhai Ka bypass under the Rasta Rok Andholan. Even this peaceful protest answered with bullets by the Indian security forces, 24 Sikhs killed and hundreds more wounded were at different locations during this national protest. When the government of India sent their tanks and cannons to destroy Sri Akaal Takht Sahib in June 1984, Bhai Sahib was at home in his village. Like many Sikhs around the world Bhai Sahib also started staying depressed and restless. Bhai Sahib could not concetrate on his work and when he did eventually force himself to work, he would come back home after a short period of time. Unable to sleep or concentrate, Bhai Sahib decided the only way justice was going to served was if he became the punisher himself and so Bhai Sahib joined the Jhujaru Singhs. Even though the family tried very hard to stop Bhai Sahib from sacrificing his life for the cause of freedom, but nothing could stop Bhai Sahib from doing this sewa for the panth. Soon Bhai Sahib was arrested due to a police informant. Bhai Sahib spent many months in Amritsar, Ferozpur and Barnala jails. In jail Bhai Sahib met other Jhujaru Singhs who also felt the pain of the panth. Now Bhai Sahib was even stronger mentally and wanted to eradicate the slavery which was slowing choking the Sikhs to death. Upon being released Bhai Sahib gathered the likeminded youth from his area and established the Saffron Tigers Force of Khalistan and started doing armed actions. While Bhai Sahib was underground, he had come home to his family. At the same time Bhai Balbir Singh Bira of Khalistan Commando Force had also come to Bhai Rupa to see his family as they also lived in the same village. A police informant had notified the police that these two warriors were in the village. Within a short period of time, the Indian security forces surrounded the village and an encounter started. Both singhs faught the battle bravery and managed to escape causing damage to the police. A Jhujaru’s life is Only Completed when he/she Attain Shaheedi fighting for freedom. On 3rd September 1992, Bhai Sahib’s Jhujaru life was also complete. It was roughly 1-2 o’clock in the afternoon, Bhai Sahib was resting in the farms of village Kesar Singh Wala near Dyalpura, district Bathinda. An informant told the police that Bhai Sahib was resting in the farms. It was in the space of couple of minutes that the engines of police jeeps were heard accelerating towards Bhai Sahib’s locations. Bhai Sahib was alone and he realised that he had been surrounded by the police, so the only thing to do was to battle. Bhai Sahib fought for many hours and even when wounded Bhai Sahib did not stop battling till his ammunition ran out. Instead of coming into the hands of the enemy alive, Bhai Sahib swallowed a capsule of Sy-Nyde and attained shaheedi after his ammunition had run out. Bhai Sahib added his name to the endless list of Sikh martyrs of Khalistan. Previous post September 1, 1604 The First Prakash Purab of Shri Guru Granth Sahib Ji.